Steve’s first two releases on one CD. This CD issue is from 1992. European influenced sequencer music (i.e. Tangerine Dream, Klaus Schulze) is balanced with early tribal-atmospheric pieces that suggested what was to come. 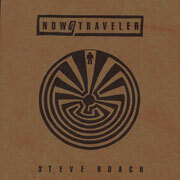 This 1992 re-issue compiles the little known first two releases of synth ambient pioneer Steve Roach, the EP Now and first full length album Traveler. While containing many synth tones and textures which would appear in Roach’s noted later works, these recordings have a strikingly bold style which is indeed less ‘ambient’, and denser with melodic composition. With strident lead playing, punctuated notes and frequent changes, it is active listening music with intense dramatic flair. It is quite soundtrack-like and borrows heavily from Tangerine Dream, particularly pieces like Phaedra. In many ways Roach’s style never changed. The arpeggiated backbone, the spiralling percussive loops creating a gentle pulse without cluttering the space, are already present. His melodic Berlin School synth worship fascinations are fully intact, as is his distinct melodic ear. Already, he possesses a knack for evoking a sense of timeless zen, the gentle but relentless motion of clouds passing across the sky, the windswept emptiness of a clearing. What he most certainly improved upon is editing: knowing which of his pieces evoked the strongest emotions, and how to sequence them into complete, thematic narrative works. With contrasting styles on every piece, this album feels like a compilation of unrelated snippets. Nothing in particular differentiates the styles of Now and Traveler, and nothing in particular ties many of the pieces together within those albums. Frequently, I find myself jarred out of the mindset of the more thoughtful pieces by sudden, loud rhythms and shrill melodic work. The texture of this recording isn’t as rounded or pleasing to the ear as even albums like Structures in Silence from just a couple years later in 1983. There is some harshness in the arctic white brightness of the tones. Those who enjoy the piercing clarity of an unfiltered analog saw wave may be pleased by this. Personally, I feel it stops me from playing the album very loud. Pieces such as opener “Growth Sequence” and “Cloud Motion” are lost masterpieces, inferior to material found on Structures in Silence and Dreamtime Return only in its recording quality. Somehow I find these pieces more poignant and haunting than the pleasant warmth of Quiet Music or the pulsing electro of Empetus, even if these are consistent albums. These pieces are most indicative of the styles Roach would pursue later on, and make me glad of the direction he chose. A couple times, we catch a glimpse of directions never pursued later in Roach’s career, such as almost-techno percussion and chant sampling of “The Ritual Continues”, recalling industrial music (early Muslimgauze) in their usage. Tribal and chant oriented tracks did continue to appear on Roach’s recordings later on, of course, but always with organic hand drum percussion rather than drum machines, and live recordings of throat singers rather than samples. As such, this piece and the similar “Mysteries Continue” from Traveler aren’t as convincing as Roach’s later tribal works. Perhaps the low point of the collection, “Inquest”, is a slice of blocky, raw sequencing, with note-heavy, dissonant progressions, at times confusing. Hearing the clumsiness of this, it is fitting that Roach stuck with a more flowing, improvised style of composition from here on out. “Snow Canon” is similarly cheesy, actually sounding much like the Mannheim Steamroller’s legendary christmas album. This album features rapid pacing and a wide variety of approaches, something which Roach abandoned later in favor of thematic, slower paced albums. This, his most experimental era, is understandably hit or miss. It features more of the dry, unprocessed sounds generated by the equipment he used, before he’d learned to sand the edges carefully off. The album isn’t much of a cohesive experience as a whole, with several tracks seeming to lack the emotion of the best ones, and better off skipped. However, there are pieces of music here which measure up to Roach’s most powerful works, such as the opening pair from Now and interlude “Light Sound” from Traveler. It would seem Roach realized on his own that he should create entire albums full of tracks such as these. Some artists lose over time some special essence present in their early work, but this is certainly not true for Roach. I see nothing but improvement from this point on.